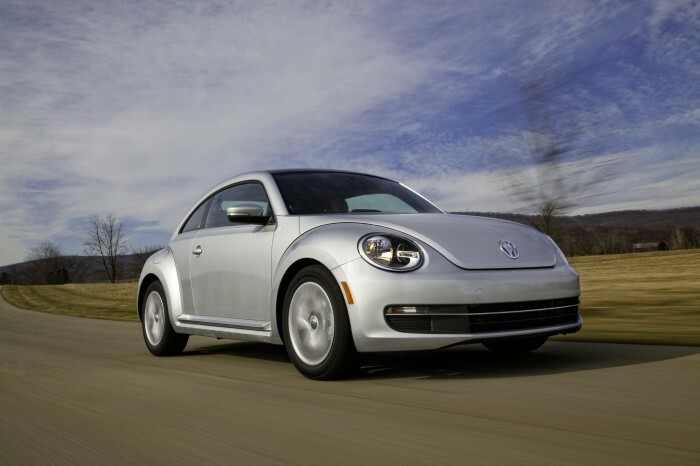 The 2013 Volkswagen Beetle lineup gets some new additions including an optional turbocharged diesel engine, a soft-top convertible version of the Beetle, and a special Fender-signature version Beetle which has a dash treatment inspired by the finish seen on Fender’s popular guitars. Let’s be real, we don’t have to tell you what the VW Beetle looks like, its unique round shape surviving through the decades with only minor body style changes. Today’s two-door Beetle features a hatchback design and is more sleek and modern than ever before. The Beetle 2.5L is powered by a 2.5-liter five-cylinder engine with 170 hp and 177 lb-ft of torque, while the more powerful Beetle Turbo gets a turbocharged 2.0-liter four-cylinder that puts out 200 hp and 207 lb-ft of torque. For a more efficient engine, choose the Beetle TDI which is powered by a 2.0-liter turbodiesel creating 140 hp and 236 lb-ft of torque. The 2.5L gets 22 mpg city, 29 mpg highway, and 25 mpg combined with the automatic transmission. Impressively, the Beetle Turbo gets even better fuel efficiency ratings, rated at 22 mpg city, 30 mpg highway, 25 mpg combined. Finally the new turbodiesel is incredibly efficient, earning ratings of 28 mpg city, 41 mpg highway, and 32 mpg combined. The 2013 Volkswagen Beetle’s interior draws inspiration from the original flower-power VW Beetle, featuring a trim that runs across the dash and doors that can be painted the same color as the exterior, just like the good old days. That’s where the similarities end though, as today’s Beetle is packed with modern technology, a clean design, and fine materials. The interior is deceivingly spacious, even providing plenty of room for tall drivers. The spacious trunk offers 29.9 cubes of maximum space when the rear seats are folded. The 2013 Volkswagen Beetle comes standard with traction and stability control, antilock disc brakes, front side airbags and side curtain airbags.